Śrī Sītānavamī 2018 : will be celebrated on 24 April 2018. Śrī Sītānavamī represents the appearance day anniversary of Sita Ji, the consort of Supreme Purusa Lord Rāma, in this Vibhuti-Loka. On this day in Treta Yuga, the Parashakti Sita herself appeared directly from the earth to accompany his consort Lord Rama and help him in establishing the Dharma. Śrī Sītānavamī falls in the Vaishakh Shukla Paksha on the Navami, the ninth day in the bright half of the month of Vaishakh in the Hindu calendar. It is also known as Janaki Navami. 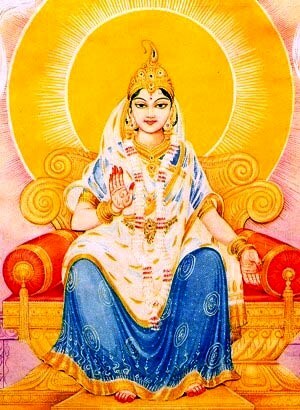 Since divine mother of universe, Maa Sita directly appears from earth, not from anyone's womb, therefore she is called Ayonija (non-uterine birthed). How did King Janaka accept Sita as his own child? Thus the divine Sita who has no match in whole universe became the legitimate daughter of King Janaka and princess of Videha. Since then Janaka became a great fond of Sita Ji. Śrī Sītānavamī is one the most important festival for all Hindus and especially Vaishnavas, and also for Shakta tradition in Sanatan Dharma. It has one of the most important status in Vaishnava celebration as on this day, the Parashakti who is Sita in her ultimate original form, herself appears on Navami the ninth (9th) day. It is also evident as "9" number is the most sacred number in Sanatan Dharma and it is largest one digit number. It is the number which represents the perfectness. So Navmi is the day chosen by the perfect personality, the best one among women, the absolute and ultimate reality to manifest itself for creating bliss in heart of devotees . Only the most superior, the supreme personality appears on Navmi for example Janaki Navami and Ram-Navami. Any devotee who will observe fast on Sita-Navami (Śrī Sītānavamī) with full devotion and without any attachment towards the worldly fruits then S/he gets the eternal abode of Sita Ji i.e. Sita-Vaikuntha (which is within Saket Loka, and most su region full of mellow . Therefore, it is duty of everyone to observe Shri Sitanavami Vrata, for men and women alike, even gods in heaven celebrate the appearance of Sita Ji and observe vrata on this day. On which day and how should a Vaishnava observe Shri Sitanavami Vrata? Vaishakh Shukla Navami with Navami present during mid-day is celebrated as the aappearance day of Shri Janaki, Sitanavami is also known as Shri Janakinavami. If Navami is present during two consecutive days during afternoon, then a Vaishnava should leave the first day and celebrare and keep fast on the second day. How to observe Sitanavami Vrata? Sage Markandeya, in Bhavishya Purana, narrates the glory of Sitanavami Vrata, and there he tells how to observe it. Markandeya Rishi further says in Bhavishya Purana says the person who wants to observe fast on Sitanavami should prepare self one day before Vaishakh Shukla Navami (Sitanavami) i.e. Vaishakh Shukla Ashatami. On the Vaishakh Shukla Ashtami, devotee should take bath early in the morning and pray to Sita and Rama, should restrain senses from Ashtami, and eagerly wait for the Navami to celebrate the appearance day of Sita Ji. Sage Markandeya says Sitanavami is best among all Vratas, and everyone should observe Vrata on Sitanavami, It is for one and all, from gods in heaven to humans, Gandharva, Yaksha, Naaga, all celebrate Sitanavami and keep fast on that day to get the mercy of Jaanaki and Raghunandan. Definitely, one would get all desired fruits and even without desiring, Yet the main motive behind Sitanavami Vrata should be to please Janaki and Raghunandan, to get their devotional-service. On the early morning of Sitanavami, devotee should take the Sankalpa (a pious vow in heart) that Oh' Sita, to get devotion in your lotus feet and Your consort Lord Shri Rama, I shall observe fast for whole day today (Śrī Sitanavami). Sankalpa is done by taking some water, some grains of rice and flowers in the palm of right hand, and then one should utter the Sankalpa mantra (keeping the meaning in heart). After reading the Sankalp mantra, one should leave the water (with rice-grains, and flowers) of the right palm in front of self. A Vaidic Sankalpa comprises person's identification along with his lineage, particular geo location, purpose, (wish/desire and determination), target (Deity). Therefore, it needs to be customized by the person as per one's Vaidic identification, time, place and the wish and the determination. For Rama-navami-Vrata, the Sankalpa-mantra is provided above. Those devotee who are not living in Bharat-Varsha (India), they should say the name of country in place of 0. जम्बूद्वीपे भारतवर्षे आर्यावर्तैकदेशे - jambūdvīpē bhāratavarṣē āryāvartaikadēśē' e.g. america-dēśē or russia-dēśē etc. 14. the name of Vrata i.e. Shri-SitaNavami-vratam or Shri-JanakiNavami-vratam. If one wants to get some fruits from observing fast on Sitanavami, one should take vow (Sankalpa) in this way "मम भगवत्प्रीतिकामनया ( वामुकफलप्राप्तिकामनया ) सीताजन्मोत्सवव्रतमहं करिष्ये " (That I am going to fast on सीता नवमी Sita-Navami Vratam for ------- tell your desire). After doing Sankalpa in this way one should abstain self from anger, lust, greed and desire, etc on that day. In the morning of dashami (i.e. the next day of Sitanavami), one should worship Bhagavan Shri SitaRama with devotion, and donate something to some Rama-devotee and feed them etc, as per one's financial capability (vittānusārataḥ). And thereafter, one should open the vrata. Sitanavami Vrat bestows the supreme abode of Shri Rama, as well as fulfills all desires on the earth even without asking, if done properly with the Shraddha (reverence) and Bhakti (love and devotion). What to do on Shri Sitanavami? On Sitanavami, a devotee should observe fast, and do worship of SitaRama in morning, afternoon and evening. The main Puja of Sitanavami is in afternoon. In afternoon, one should do especial shodashopachar worship of Sita Ji, her consort Shri Rama and her father Shri Janak Maharaj, her mother Sunayana and mother earth and Guru Shatananda, etc. In the morning, a devotee should establish the Idols or image of Sita (or SitaRama) in center, and her father King Janaka, her mother Sunayana and Bhu Devi, and her Kulguru priest Sage Shatananda on the four corners, and in afternoon one should worship all. One should do shodashopachar Puja of Sita and Rama in afternoon, for step by step Shodashopachar Puja, one can refer the Ramanavami Vrat Page here. One should worship her in various ways, offer her bath, sandalwood paste, new clothes, ornaments, fragrance, flowers, fruits, Naivedyam (sweets), light of ghee etc. Throughout the day, One should chant the mantra received from one's gurudeva as much as possible, more particularly Yugal-mantra of Shri Shri SitaRama, recite Janaki-Stavraja, Sita-Sahasranaam, and do swadhyay of Sitaayanam, Janaki-Charitamrit etc, and sing and dance in night to please Shri Shri SitaRama. 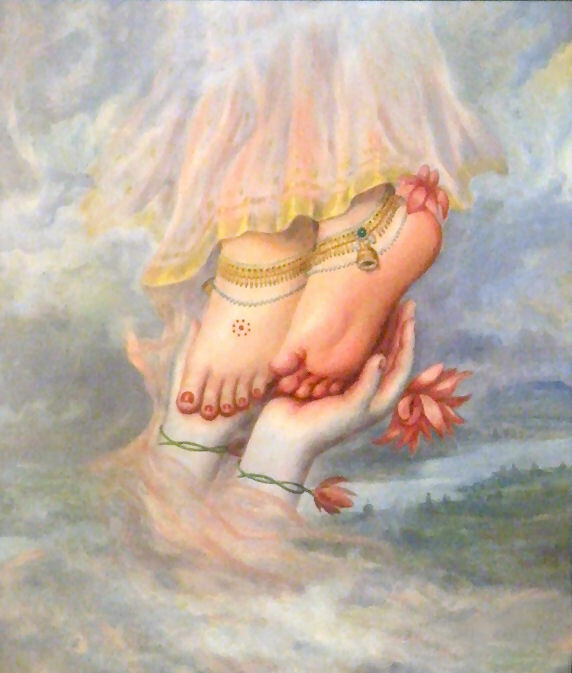 One should meditate upon the lotus feet of Sita and Shri Rama at intervals throught the day on Sitanavami. Study of scriptures like Sitayanam, Janaki-Charitamrit, Ramacharitmanas, Ramayana etc can be done regularly from the 1st day of Vaishakh Shukla-Pakhsa and should be concluded on either Janakinavami or Vaishakha-Purnima as there are the appearance days of Sarveshvari Shri Chandrakala Sakhi and Sarveshvari Sri Charusheela Sakhi of Sita Ji on Vaishakh-Trayodashi and Vaishakha-Purnima respectively. Sarveshvari Shri Chandrakala Sakhi is the head of the groups of Sakhis on Sita's side and Sarveshvari Sri Charusheela Sakhi is the head of the groups of Sakhis on Shri Rama'side. After establishing the deity or image of SitaJi and her relatives, devotee should do Avahan and give them Asanas (seats), and waters for Paadyam (washing feet), Arghyam (washing hands), Achamanam (washing mouth) and then one should give them bath. to see Sri Sita-Vandana (Prayer to Sita) in detail. O' auspicious Bhagvati Sita! Please come near us. We bow down to You and greet You! O supreme deity endowed with the supreme fortune and auspiciousness! Please be kindly disposed towards us in such a manner that You be compassionate-hearted towards us and as a result You be a bestower of beautiful charming fruits for us! I bow to Sītā the beloved consort of Śrī Rām, who is responsible for the creation, sustenance and dissolution (of the universe), removes afflictions and begets all blessings! 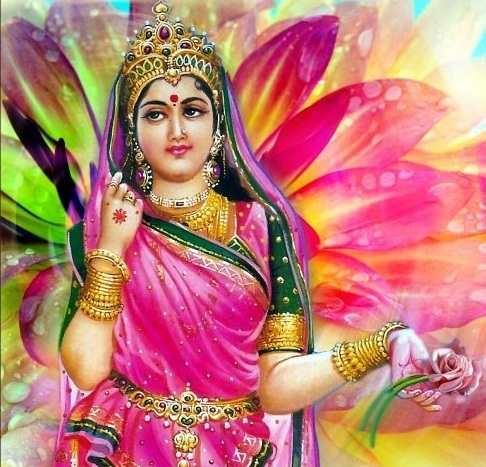 Janaki, the daughter of Janaka and mother of the universe and the most beloved consort of Sri Rama, the Fountain of Mercy, I seek to propitiate the pair of Her lotus feet, so that by Her grace I may be blessed with a refined intellect. I reverence the feet of Sita and Rama, who though stated to be different are yet identical just like a word and its meaning or like water and the waves on its surface, and to whom the afflicted are most dear. After making salutations to all, one should worship all with flowers, rice-grains, fragrance, dhup, and deep (soft lights) etc. Thereafter, One should chant the Sita-Mantra "ॐ श्रीं सीतायै नमः" at least 1008 times. After chanting, one should do one tenth times (1/10 times of total Mantra done) Havan with Ghee, sesame, barley, and other stuffs for Havan. Then after completion of Havan, One should seek forgiveness for all offenses done and any mistake done during the puja also from Sita Ji. In the end, one should do Aarati of Sita Ji or recite Jaanaki-stotra. And observe fast whole day. On the next day, after worship of Shri Sita-Rama, devotee should open the fast. It is advisable to donate something to the Shri Rama devotees or one's Gurudeva or feed some cows or Brahmina before breaking the fast on Dashami. Janakinavami Vrata is for all, it bestows the Supreme abode of Sita i.e. Sita-loka within Saket Loka, and fulfills all desires on the earth also. They who do not observe and celebrate Janakinavami vrata intentionally, either due to their pramad (laziness) or moha (ignorance), they are called fallen among humans. The Supreme Absolute truth (brahm) always exist in the divine couple form, as the husband and the wife, for increasing the Rasa. Bhagvati Sita is the eternal consort of Lord Rama, the supreme personality of Godhead. She is perfect match to her consort Shri Rama in all aspects. While Sri Rama is the Purushottama (पुरुषोत्तम), the best among men, so Sita Ji is the best among women of all the worlds, NaariNaamuttama (नारीणामुत्तमा). None could touch even the shadow of Sita Ji in glory, She is the perfectness of all womanly virtues. Divine Sage Narada says to Valmiki: Sita, the most dear to Lord Rama like his own life (प्राण समा हिता ), is his eternal(नित्यम्) consort (भार्या). Divine Sage Narada tells Valmiki that Sita, the best one among ladies, is a possessor of all best qualities befitting to an ideal lady. Though Valmiki wrote Ramayana for cherishing the glory of lord Rama, the most superior and his exploits, however when Lord Rama heard very attentively the same melodious Ramayana through the mouths of Luv-Kush, he told that it is even endowing good fortune to him not because of his own saga, but the story is narrating the glory of maa Sita, the eternal consort of Rama, the soul of Rama (भार्या नित्यम् प्राण समा हिता ॥ १-१-२६). 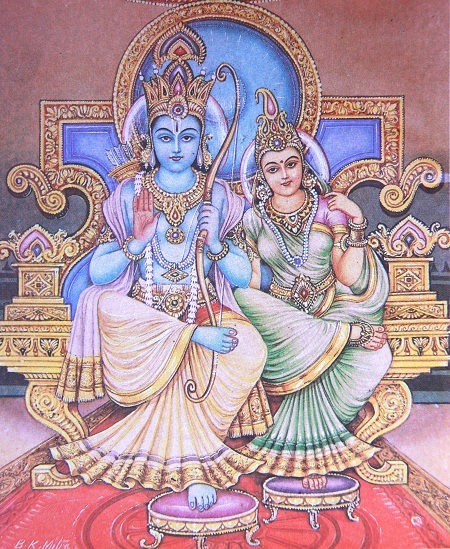 Here, Shri Rama himself accepts that this legend is 'efficacious' for it is the legend of Sita, and were it be Rama's alone, he will get the blemish of self-glorification, aatma prashamsaa doSa, however Rama being the best among men can't do self-glorification though his own mouths and brave heroes of legends cannot be subjected to such a blemish. That’s why Valmiki Muni says, in Ramayana the sublime legend of Sita is primary conduct and Ravana's elimination by lord Rama is secondary. Sita's conduct (Sublime legend of Sita) is the primary aspect and Ravana's elimination is secondary in the epic of Ramayana. Thus Ramayana’s primary name is Sita-Charitam, सीताचरितम् as indicated by Brahmarshi Valmiki.